Wow, when I read the book description I thought this was a book I had to read. It seemed to have it all,an historical thriller that incorporates fairy tales, the occult, murder, theft, and mystery with Italy and the the Middle East as backdrop and written by an award winning female Canadian author. What more can a girl ask for? In a book I mean. The book begins in the year 1631 with an exceptionally cruel and viscous ransacking and burning of an estate in Italy with only a small cedar chest bearing a white cross on its cover being spared and taken away. We then jump to the year 2003 in London, England where we meet our narrator, John Madison, an American art dealer who on behalf of a British client who insists on remaining anonymous, is charged with the task of obtaining a rare book of fairy tales offered at auction. Although not a regular practice, the commission is sufficiently large enough to forego insisting on knowing who he will be bidding for. He is successful. Disobeying the only direction given, that he must not open the box to see the book inside, was all the more enticing due to the mystery of his client and he, in normal fashion, opens the chest, is examining the contents when a strange man enters his hotel room, claims the book is his and leaves with it. Madison, suspected of having a hand in the theft, is determined to find the thief, reclaim the book, and clear his name. That is when the main action begins. His first mystery to solve is just who hired him to bid on the book and why the secrecy. Each clue he finds takes him a little further, from England to Naples and on to the Middle East and from the present day back to the 17th Century and back again. Synopsis: excerpt taken from book cover"...John Madison travels to London to purchase at auction a rare seventeenth century Italian book of fairy tales for an anonymous client. Madison is warned about the book's malevolent history. 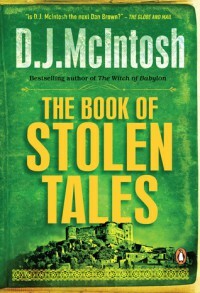 Before he can deliver it to the buyer, he is robbed by a mysterious man claiming to be the book's author. When his client disappears and the book's provenance is questioned, Madison must immerse himself in the world of European artistocracy and rare book collectors. As the dark origins of certain fairy tales appear to come to life, Madison discovers that a well-loved children's story contains a necromancer's spell and points to the source of a deadly Mespotamian plague." I loved to read how the fairy tales we all grew up with actually had their origin in historical happenings with real people and events being the models for the stories. The author did a beautiful job of putting the main characters right into the heart of many of the tales weaving the past, present, the occult and the fairy tales into a very readable book. Page 163 [pullquote] More than once over the last few days I'd felt caught up in some wild fantasy. And the narrative seemed to grow more bizarre with each passing hour. That quote essentially summed up my feelings about the book. While the tale was wildly entertaining, one had to suspend all disbelief and just go with the flow in order to enjoy it. I mean, do I really believe it possible to be brought back from the dead after being dead for nearly 400 years and then blending in with normal society. Geesh, if I can look a fright when wakening from a few hours sleep image how he must look after all that time. Would I recommend it? For a fun read, sure, but if you're looking for something a little more serious and realistic I suggest you look further.